Welcome! I am so excited to be participating in this blog hop today! I know you will see some great creative projects as you hop from blog to blog! My card features the Background Bits stamp set - that is one of our exclusive sets just for our hosts! This card goes together very quickly, and uses just a few supplies, making it easily duplicatable! I have created a step by step tutorial and supply list for you. EARN MORE FREE! Now through the end of June, you can earn an extra $35 in host rewards when you host a party of $350 or more! Get your friends together - host a party - and earn extra host rewards! Of course, you don't even need to actually "host" a party - you can gather orders together from your friends and hold a book party - and earn extra rewards once the orders surpass $350! Please contact me with any questions, should you be interested in hosting! Thanks for visiting today and enjoy the hop! Very pretty! 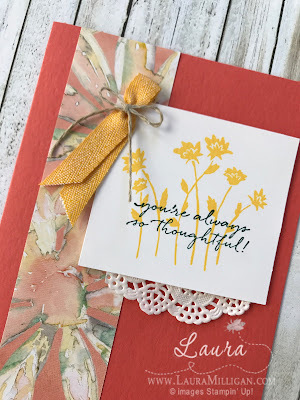 Love the colors and your stamping is perfect! Love the simplicity of this gorgeous card. Great card, Laura! 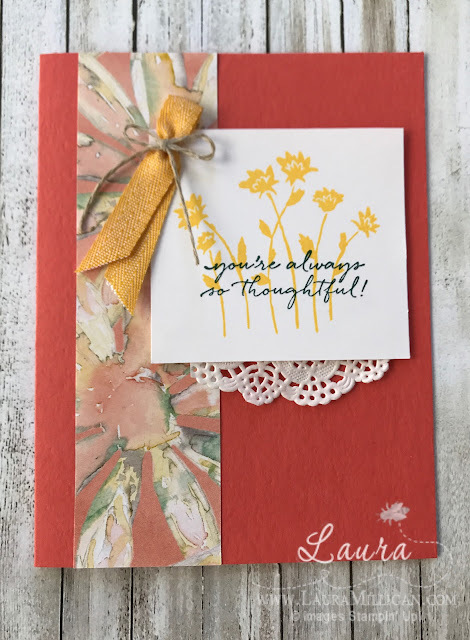 I love how simple it is yet pops with the patterned paper. Great card for a class! Thank you! Simple always seems to work for me! Beautiful1 I love this DSP with this stamp set. It really pulls it altogether. Laura, how lovely! I've been struggling with what to do with that pattern of DSP and you've used it brilliantly! Thank you - love this paper!